Facebook announced their new Timeline earlier this morning and it looks beautiful! It’s definitely a new way of expressing yourself. Profile pages will now have some more personality! The feature won’t be available for everyone until later this month, but if you’re too anxious to try it out, follow these steps on TechCrunch to turn on your Timeline profile. If you already have a developer account, you can skip steps 4 and 5. Instead, go into one of your apps and head straight to “Get started with Open Graph” section. Enjoy! Excited about Google I/O 2011! I’m so excited about attending Google I/O 2011! Getting tickets to the attend the conference was difficult this year, so I’m grateful that I have the opportunity to go. I can’t tell you how many times I hit refresh in my browser, hoping my registration went through! I’ll be attending most of the Chrome sessions at the conference. I’m interested in seeing how HTML 5 is being used and the direction this new version of HTML will take the web. I’m also curious about what Google’s going to announce at their keynotes. These will be streamed, so you can follow along online! I won’t be live blogging, but I will be live-Tweeting! So please follow @daynah for my updates and live coverage of the conference. I’ll be posting plenty of geeky goodies and photos. Another Google I/O has come and gone, and I had a fabulous and geeky time there. The great thing about Google I/O is that it’s geared toward developers, so the sessions are usually code-based or overviews of new APIs and developments over in Google HQ. Of all the things I learned about this year at the conference, the most exciting was learning what direction HTML 5 is heading in. Last year, I learned about the new <video> and <canvas> tags, but there’s so much more now. This year’s conference was much bigger than the previous years. The conference sold out quickly with 5000 attendees. There were sessions going on in every room on the second floor of Moscone West Hall. I was most impressed with the bigger Developer’s Sandbox. It was 4 or 5 times bigger than last year’s. It was great talking to companies and developers who are already implementing Google products into their products. Although I was drained from attending all the sessions, I didn’t want to miss the Google After Party. It’s actually a very geeky event with food and robots! The MakerFaire was in town and they had some amazing displays, robots, and man-powered machines all over the party.. definitely something you don’t want to miss while at the conference. There was a lot of fun and excitement at this year’s Google I/O. There were many amazing announcements as well, including the Web-M project (standard video codec), new features in Android Froyo including support of Flash, Google TV, and our fabulous gifts for attending — the Sprint HTC Evo 4g — a gorgeous smartphone running Android! Below is a summary of all the sessions I attended. For more information on each session, please follow the links to the Google Waves. The official YouTube videos will be coming soon. For more information about the conference, see the official Google I/O 2010 website. Bringing Google to your Site – In this session, we got many different examples on how we can add Google to our websites. Some examples were using custom searches (now with auto-completion), Google Feed API, Adsense with AJAX (new), SideWiki, Buzz API and Google Font API. Beyond Design: Creating positive User Experiences – In this session, I learned that there are 7 principles for creating positive user experiences: 1) Be fast 2) Be yourself 3) Engage in conversations 4) Be willing to give up control 5) Be polite 6) Be prepared for failure 7) Be reliable. Examples of these principles were also talked about. Developing with HTML 5 – This session was great since the presentation itself was written in all HTML 5 tags and coding. If you flip through the presentation, you can try out the bleeding edge features available for browsers in the near future. Some new HTML 5-specific tags and features are offline data storage, JS APIs, <head>, <hgroup>, <nav>, <section>, <article>, <aside>, <footer>, new form field types, <audio>, <video>, <canvas>, new CSS selectors and font support, transitions, and so much more. Run the presentation in a Chrome browser to see what lies ahead. Ignite Google I/O – This session was a lot of fun. Ignite sessions capture geek cultures in a series of 5-minute speedy presentations. Each speaker gets 20 slides that auto-advances after 15 seconds. Topics were of various topics, from surviving the North Atlantic ocean and breaking world records, to our habits of searching on the internet, to playing battleships in a pond. It was very entertaining and super geeky.. and is best if you see the videos once they’re up. Surf the Steam: Google Buzz, Location, and Social Gaming was not my favorite session since they spent a few minutes talking about the new Buzz Api, and then started stepping through code on how to implement the BuzzBingo game. The one thing I learned from this session was that there’s a new Buzz API — great if you want to create a social game! SEO Site Advice from the Experts was an excellent session. It was a panel of SEO experts who went through a list of submitted sites and let us know what the site is doing right and wrong about SEO. They talked about how important it was to use text on your webpages, how meta keywords aren’t indexed by Google because people inflate them, branding techniques starting with the domain name, content needing to be above the fold, page ranks, 301 redirects, and much more. Optimize every bit of your site serving and web pages with Page Speed – In this session, I learned about a new project called Page Speed. It’s an open-source Firefox/Firebug Add-on. Developers can use Page Speed to evaluate the performance of their web pages and to get suggestions on how to improve them. Showslow.com is a demo website that shows the speed of websites. For more information, see Page Speed. HTML 5 Status Update – In this session, the Chrome team went over new features in HTML 5 we should keep an eye out for. Their demo of the new Gmail was fun and quite intuitive. Drag and drop attachments as if it was a desktop app. New areas in HTML 5 include Offline storage, Media, Networking, CSS3, and Platform Integration (drag and drop, notifications, geolocation). Disappointed that the iPad didn’t come with a camera? Well, so was I. But that doesn’t mean you can’t snap live photos on your iPad! All you need is an iPad, iPhone, and two apps. Here are a few steps to get your iPad camera up and running! On the iPhone, download and install the “Camera-B” app. It’s available for free. 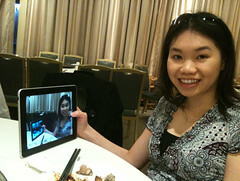 Now launch Camera-A and Camera-B on the iPad and iPhone, respectively. Camera-A on the iPad will show you whatever image Camera-B on the iPhone is pointing at. When you’re happy with an image, click on the shutter button in the middle on the iPad and that image will be saved to both devices. Camera-A and Camera-B are two very simple to use apps. The hardest part is remembering to turn on the bluetooth! Camera-A on the iPad also have options to zoom in on an object as well as a toggle to turn off saving to the iPhone. Since the camera is on the iPhone, it’s much easier to maneuver it to point to the subject you want. Also keep in mind, the image will only be as good as the iPhone camera, so it may appear noisy on the iPad due to the higher resolution. There is also no auto-focus in the Camera-B (iPhone) app, so you can’t tap and focus on an area like with the default camera app. Overall, if you want to quickly capture live photos onto your iPad, these two apps are great for that. They can’t be more simple! Camera-A and Camera-B are both available in the iTunes App store. For more information, be sure to check out the official WordCamp SF 2010 website. 5 iPhone Apps to Celebrate Earth Day! Happy Earth Day! This should be an occasion to celebrate everyday and you can use the following iPhone/iPod Touch apps to do just that! Love Mother Nature and you’ll be surprised at how much she’ll love you back. The Power of Green by Con Edison Here’s a beautifully made app that has great tips on how to save money in your home and office while going green! Tips include Weatherization, Heating, Cooling, Water Heating, Lighting, and Appliances. Included are 101 flashcard tips, 6 videos, and a checklist for you to keep your updates. 21st Office This app tests if you’re working in the 20th or 21st century! It asks you a series of questions in topics of Commuting, Business Meetings, and Reading. Then it examines your working habits and gives you a summary on what currently do, and how you can improve. There’s also a lot of great tips added by the community. GoodGuide is an app that helps you find safe, healthy, and sustainable products while you shop. How does it work? Simply scan the barcode of the item with your phone and the product’s details will display. These details include ratings for health, environment, and their social responsibility. The Lorax – Dr. Seuss is a wonderful ebook that’s perfect for Earth Day! It’s about a character who cuts down all the trees in the forest to make clothes. The Lorax warns him that his actions are hurting everyone, but he doesn’t listen. There’s a great moral to the story that will certainly engage young minds to help Mother Nature more. It’s a great story with beautiful animations and a narrator who reads to you! iRecycle an excellent app to find your nearest recycling centers and green events. Simply type in the item you want to recycle and it will find the nearest location that would accept it. Links to green tips and articles from Earth911.com can also be reached within the app. While attending MacWorld Expo 2010, I went to Nick Floro’s session – Market Symposium SA: Web Development: Tools, Trends and Technology. It was a great session on various Web 2.0 technologies. Topics covered were: Web 2.0, Designing Interfaces, Social Media, Video on the web, Simulations & Games, Project Management, Prototyping Techniques and other Tips and Tricks. Below are more information about the session as well as the slideshow. Attend this day symposium and learn about the latest trends, solutions and what customers want today in web development. You will gain valuable knowledge on how to manage projects, developing new ideas, the latest hardware and software tools and what’s new in delivery for the web. Whether you’ll be creating marketing, education, presentations, e-learning, e- mail campaigns, asset and content management applications you won’t want to miss this session! Whether you are new to web development, a graphic artist wanting to learn more, a marketing manager, production coordinator or an instructor, this is the symposium to see the latest in web technology. View more presentations from Nick Floro. Dr. Seuss iPhone Apps now 99 cents! In honor of Dr. Seussâ€™s birthday and NEAâ€™s Read Across America Day, Oceanhouse Media is dropping all Dr. Seuss iPhone/iPod Touch/iPad apps to $0.99! Grab your favorite Dr. Seuss classic ebooks or camera apps. But hurry, this offer will last for one day only — today — Tuesday, March 2, 2010! Have your child learn the ABC’s with this favorite classic book. It’s full of beautiful and colorful pages as well as fun animations. Get the classic “That Cat in the Hat” ebook. Enjoy the beautiful artwork and animation as the book reads to you right on your iPhone / iPod Touch. It’s perfect for the little ones. Of all the Dr. Seuss apps available now, this is definitely my favorite! I just absolutely love the story and it can be enjoyed by both kids and adults. The narrator is wonderful and the animation and illustration is just lovely. I highly recommend it. Full Review..
Would you like to be Mr. Nice Grinch, or Mr. Mean Grinch? Here’s a fun game to either toss presents at the Who’s houses or snowballs at them instead! Full Review..
Take photos of your friends and disguise them as the mischievous cat in the hat! A fun app to make you smile with your favorite Cat in the Hat illustrations! Take photos and insert your favorite Grinch frames on your friends! You can be Mr. Nice Grinch, or a Mean one, or even one of the Who’s. Full Review..
Read more about Oceanhouse Media’s Dr. Seuss iPhone / iPod Touch apps! GameSalad – Create Games without Coding! I attended MacWorld Expo 2010 recently and one of my favorite booths was GameSalad. They promised that I could make a game without any coding or programming at all. So yes, I was interested! I sat in for the beginner session to see how GameSalad works. 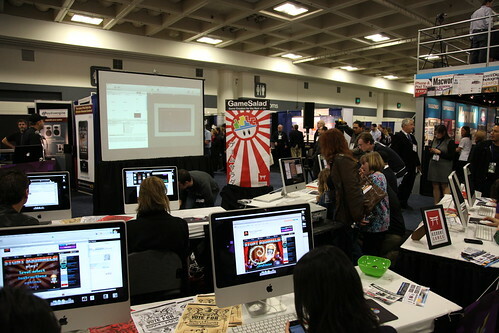 Photo by Albertech.net/@dragonal; Taken at MacWorld Expo 2010; I’m in the lower right! GameSalad is the worldâ€™s most advanced game creation tool for non-programmers. With GameSalad, game makers of all levels can bring their ideas to life without programming a single line of code. Build games visually using a drag-and-drop interface along with a robust behavior system. Publish your games quickly and easy to the iPhone, iPod Touch, Mac Desktop, and the Web. If you want to learn how to make games for the iPhone (or Mac), try out GameSalad. They had training sessions on the expo floor, which I thought was a lot of fun. Sessions ranged from beginner to advanced, and didn’t require any programming knowledge at all.. just a bit of creativity. Basically, you can import your graphics (let’s called these actors) into the GameSalad software. Then you can place your actors onto the canvas (like the background) and add in other pieces in layers. Add behaviors to these ‘actors’ and you got yourself a game! For the beginner session, we made a pinball game. We added the game’s background, along with the flippers, pegs, and pinballs. The flippers behaviors were control by the Left and Right Arrows. When clicked, the flippers would move up in an angle. If the ball touched a peg, points would be added up in a scoreboard. The creation you create with GameSalad is all yours. This also means if you are creating an iPhone version of the game, an Apple Developer’s license is also require since you are publishing it under your account. If you’re a graphic designer with an eye for games, definitely consider GameSalad. The software starts at $99 a year. I was able to create a simple pinball game in under 30 minutes… just imagine what you can do with just a little more time. For more information, see GameSalad.com and follow them on Twitter. I thought Abvio’s Runmeter, Cyclemeter, and Walkmeter iPhone apps deserved Beatweek’s Best of Show Award at MacWorld Expo 2010 for their innovative way of motivating individuals to exercise. I simply loved the features they integrated in the 2.0 versions. Are you a fitness enthusiast? If you enjoy running, cycling, or going for a walk, try out Abvio’s new line of fitness apps — Runmeter, Cyclemeter, and Walkmeter. These exercise apps use the iPhone’s GPS to track and visualize exercise activities as well as help improve athletic performance and health. Each of these apps are similar to one another except for the fact that they come pre-customized to suit the needs of its user — the walker, runner, or cyclist. An iPhone-centric approach, no Web site accounts, passwords, or ads required. Ghost racing against previous runs, walks, and rides along a route. On-device calendar of all runs, rides, and walks. On-device graphs of pace and elevation. On-device manual entry of runs, walks, and rides. The first apps to support use of the iPhoneâ€™s earphone remote to start and stop the stopwatch. The first apps on the iPhone to speak Twitter replies using text-to-speech technology. The first GPS apps to include a Twitter client for reading and composing tweets. The first GPS apps to use fuzzy logic to filter GPS locations for more accurate GPS location reporting. The only apps among our competition to allow full export of all your data. Want to send a special treat to your sweet? Do it right from your iPhone or iPod Touch with the Sweethearts app. Sweethearts are the traditional conversation heart candies from Necco. Now they a fun app that promotes their new candy flavors and their new “Tweet Me” heart. You start by customizing up to 5 candy hearts to give away. Tap on the candy to edit the text. Add another by tapping on the plus sign. Remove it by dropping it on the trash icon. When you’re happy with your box of candy, you can tweet it, DM (direct message) it to someone, or email them. You must login into Twitter before sharing the box of candy though. Your friend(s) will then get a unique link to the box of candy you made for them. It’s simple and is a fun way to say you care. There is also an option to browse and view other boxes of candy created worldwide, boxes created by people you are following on Twitter, as well as a retweet option. What I would like added to this app is the ability to add more than candy hearts in a box as well as pick a song for the candies. Other than that, it’s a simple app to bring a smile to anyone’s face. Here is an example of what the link will take you to. The box of candy will open up for your friend and the candies will be displayed for them to play with. You can read more about the Sweethearts app on their official website: MySweethearts.com and follow their Twitter account: @my_sweethearts. The app is free and available for download in iTunes App Store. I attended the Software Development for iPhone and iPod Touch Seminar yesterday, presented by Steve Hayman. He briefly talked about development for the iPad (which is very similar to iPhone / iPod Touch development), as well as how to create web apps and native apps during the presentation. These are my notes from the session. I’m attending a special Software Development for the iPhone and iPod Touch Seminar in Riverside, CA this Wednesday. It’s a free two hour workshop on how to create iPhone apps! The session is geared toward students, faculty, and staff from education institutions in Southern California. If you’re interested, there’s more information below. There will be sessions taking place at four different locations in Southern California. We’ll discuss and demonstrate Apple’s software development tools for the iPhone and iPod touch, and show how individuals and institutions are building innovative mobile applications for their organizations and the wider world. We’ll highlight and deconstruct some popular applications – both web-based, and native – and show you how to get started building your own with Apple’s free developer tools. We’ll talk about web development with Dashcode, native application development with Xcode and Interface Builder, and review the integration and deployment options and Apple’s developer program. And if the presenter messes up, we may accidentally wind up demonstrating the debugger as well. I’m attending MacWorld Expo 2010 in two weeks and I’m super excited about it! I’m mostly interested in iPhone/iPod Touch/iPad app development (both web and native) as well as meeting other app developers. It’s going to be super geeky fun! They’re also having a Special iPad Event, so I’ll get to test out Apple’s new creation! I hope to see you there! Register for MacWorld Expo if you haven’t already. Here is my tentative schedule for the week. The bold items are events I’ll definitely go to and the rest are the ones I’ll try to make to. 10:00 AM – 11:00 AM – Feature Presentations: Macworld presents: BT!